According to an article from Fox News, cloning Neanderthals to create healthy, living specimens could become a reality 944NqQ Of course years ago when Jurassic Park first came out, scientists were discussion the possible reality of cloning dinosaurs. Now, thanks to the incredible increase in computing power over the last few years, sequencing genomes for such a project is becoming a real possibility according to Archaeology Magazine. Cloning is still an inexact science, however. Restoring the DNA of a specimen tens of thousands of years old faces the challenges of chemical changes, breakdown of the biological matter and a myriad of possible contaminants. Even if those challenges can be overcome, the question still remains: Should this be done? If so, to what end? 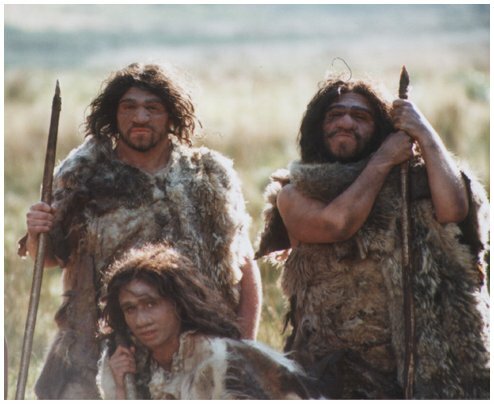 If Neanderthals were brought back, would they qualify for human rights? If there were colonies of them, how would they support themselves and their families? Would Geico be sued for hate speech or would they be the major employer for Neanderthal kind? What do you think? Are Neanderthals close enough to us to be considered to have human rights? Would we have living vignettes in natural history museums? What effect would Neanderthal tribes have on our world today? On Religion and Creationism? Ben Stein hosts this documentary which “examines the criticisms and hostilities that exist in today’s scientific field (both academic and professional) towards peers and journalists who subscribe to or even entertain the perspective of Intelligent Design in science”. I have unfortunately failed to make it all the way through this film as of this writing. At the one hour mark, I set it aside for the time being. The cinematography and editing make it extraordinarily difficult to follow. The interviews with such notables as PZ Meyers pharyngula and Richard Dawkins richarddawkins.net along with Intelligent design proponents at The Discovery Institute www.discovery.org and more are interspersed with black and white film clips from what appears to be the early years of the Berlin Wall. There are other nonsensical clips inserted to act as confirmation of a point that had just been made by an interviewee. In all honesty this looks like something a first year film student would throw together the night before a project was due while he was still high. Now IF you can get past that, the movie asks a valid question. According to the narrative, a group of scientists, teachers and a journalist have all either been fired, censured or generally had their careers ruined for bringing up the question of Intelligent Design. Details are sketchy as to the content that led to the censure/firing, etc. The film indicates that in the cases shown, merely mentioning Intelligent Design or writing about it led to the firings. IF this is the case, why were these people censured so severely? In the film, the main argument for creationism seemed to be that since a single cell is so complex, there must have been a designer. Most of those interviewed shied away from the idea that the designer was the Judaeo Christian god. They instead asked that the concept that “something greater than ourselves” be investigated as a possible theory for the origin of life. It seems a reasonable request until you consider that they can’t or won’t even define what that “something” might be. They are simply theorizing that because everything is so complex that it could not possibly have happened by chance. Their example of why it couldn’t was an animation of a guy and a bunch of slot machines. Like I said…stoned first year film student. I’m bothered by the idea that these people supposedly all lost their jobs and careers, or nearly so, because they discussed an alternative idea. The makers of this film took pains to equate the censures and firings with Nazi Germany. Obviously an extreme example. It poses the question, however, “At what point does freedom of speech cease to be free?’. I hope someone will investigate this further and find out why these people were treated like this.. This post is a complete flight of fancy. I’m stealing the idea from Skepchicks and running with it. A couple days ago one of the Skepchicks posed this question: If you could have any animal as a pet, and have it magically be domesticated and friendly, what would you choose? Most people chose big cats. One person went with a Velociraptor. So I thought “Hmm…how can I take that to the next level? Oh *I* know! THIS guy! http://bit.ly/4FdxYw : The Mapusaurus roseae. This dinosaur was larger than the T-Rex and may have even been bigger than Giganotosaurus, the guy that took over the mantle of “Biggest Badass” from good ol’ T. In other words Mapusaurus rosae, or as I like to call him, Mr. Whuffkins, was longer than a four-story building is tall. So, yeah…big meat grinder on legs. The question on Skepchicks included the word “friendly”. Sure, Mr. Whuffkins would be friendly TO ME and to people I liked. But lets have some fun here for a minute. If YOU had the biggest carnivore the world has ever seen at your disposal, what would YOU do? Personally, I’d have bullet proof armor and a saddle made for Mr. Whuffkins. Then I’d take him around to places like the Westboro Baptist Church where Fred Phelps hangs his hat. I’d explain to Mr. Phelps that when he says things like “God hates fags”, it makes Mr. Whuffkins vewwy sad. When Mr. Whuffkins gets sad, he gets hungry. He’s a stress eater, doncha know. Don’t like the way things are going in Washington DC? Mr. Whuffkins and I are happy to go eat..er..greet a few Congressmen and Senators. I can see it now. Me and my pet wandering the world making change happen wherever we go. Barack Obama would have nothing on us! It would be like the old children’s book “Danny and the Dinosaur”, just a bit, well, bloodier. Unfortunately there would be a drawback to keeping Mr. Whuffkins as a pet. No, not the food bill. He’s magical so he wouldn’t need to eat. Except for those times I wanted him to, that is. The big drawback would be the fundamentalists and creationists claiming that me and Mr. Whuffkins are proof that people used to live side by side with dinosaurs and even ride them. After all Mr. Whuffkins would be “domesticated”. And so, the dream dies. It IS fun to pretend sometimes though. See? Even skeptics have vivid imaginations! This morning I saw the last 10 minutes of Ben Stein’s documentary ‘Expelled: Intelligence Not Allowed”. I had heard nothing about this until now and I have plans to record a showing on the morning of the 20th so that I can review it in full. In the few minutes I saw, Stein uses the imagery of the Berlin Wall as being the barrier between scientists and intelligent design. He proposes that more be done to investigate the notion that if not some kind of god, then some sort of greater intelligence is responsible for the beginnings of life on this planet and the Universe as a whole. Of course this has been done with an additional emotional appeal to the ideals of freedom. He even interviews Richard Dawkins. You can see that Mr. Dawkins is trying very hard to be kind and patient with Mr. Stein in answering his questions. I do wish that Dawkins would have explained that his lack of belief in a god has to do with a lack of testable evidence. At one point Stein brought up the quote about the god of the old testament. Dawkins read the complete quote about that god being a blood thirsty misogynistic ethnic cleanser, etc. Then Stein asked if he believed in a kind, loving, gentle god. That would be the god of the new testament if I’m not mistaken. Isn’t Ben Stein Jewish? My understanding, and please kindly correct me if I’m wrong, is that the Jewish people follow the old testament and the Torah, a book I am not familiar with. My reading of the old testament shows precisely what Mr. Dawkins says. I’m looking forward to watching the entire documentary and I’ll post a review soon. I’ve noticed that there are days when places like the Skepchick site has what I would consider filler. Opinions are bandied about concerning a multitude of fluff topics. Often such issues as the Facebook bra color thing and how we fill our down time have been par for the course. Please understand that this is not a criticism of Skepchicks. They rock and I really wish I was one of them. As part of the observation, I wonder why this happens. Are there simply not enough news-worthy skeptical topics to cover? Is it that, after a while they simply run out of educational things to talk about all the time? Is it because it offers a break from those times when the stupidity of anti-vaxers, the Catholic Church, religious extremists and conspiracy theorists makes you want to ram your head through a wall?? I think I’ll take door number three. This is just a guess mind you. After all, I don’t always talk about educational aspects of skepticism. Sometimes we all need a break from the serious. And so, today we have…Filler!! TADA! Unfortunately I have seen this logical fallacy used on both sides of the skeptic/believer debate. It occurs when ridicule or mockery is used in place of evidence in an “argument”. As usual I will substitute the X’s for something cute and fuzzy. 1) Puppies (X), as some form of mockery, is aimed at the claim (C). 2) Therefor Claim (C) is false. This argument is of course based in the idea that we are working with a Base 10 system of counting. The ridicule here occurs in both the use of the word ‘absurd’ and the dismissiveness of the concept of human evolution as a whole. Usually that argument is made by Creationists who simply have not educated themselves or have chosen not to be educated on the current theory of evolution. Since the claim that the Klan, Nazis, and white supremists are not racist organizations is clearly absurd, it can be concluded that the claim that a member of a minority cannot be a racist is false. In a video released today, actor and street preacher Kirk Cameron talks about the upcoming 150th anniversary of the publication of Darwin’s “Origin of Species”. He believes that creationism isn’t getting it’s fair share of exposure. According to him, they just want their position to be heard. He states in the video (linked to here http://bit.ly/iAAP5) that a friend of his wrote a 50 page introduction and then inserted it into 50,000 copies of the book. Those copies will be given away at various colleges across the country a few days before the anniversary of the original publication date. Why colleges? According to Cameron 61% of college professors consider themselves atheist or agnostic. He also claims that the rate of people labeling themselves in that manner has doubled over the last 20 years in the 19 to 24 age group. The 50 page insert contains a timeline of Darwin’s life, his supposed connections to Hitler and misogynistic attitude along with various “scientific evidence” as to why his theory was flawed. He’s a really persuasive speaker, but no matter how you slice it, Cameron’s supposed “evidence” is as full of holes as your average sieve and it holds just as much water. We’ve heard it all before and discounted and counteracted it with scientific information. I’m guessing he and the group he’s working with think that because you’re getting a free copy of “Origin of Species”, this little addition will be happily accepted by college students. Really it’s just a pretty, shiny wrapper for this piece of propaganda. Something I find interesting is that along with the “scientific information” that supports creationism, they threw in such personal attacks as racism and misogyny against a dead man who cannot defend himself against such personal attacks.